Standing at the foot of the Marble Falls High School auditorium stage, choir director Bryce Gage made a bold statement. 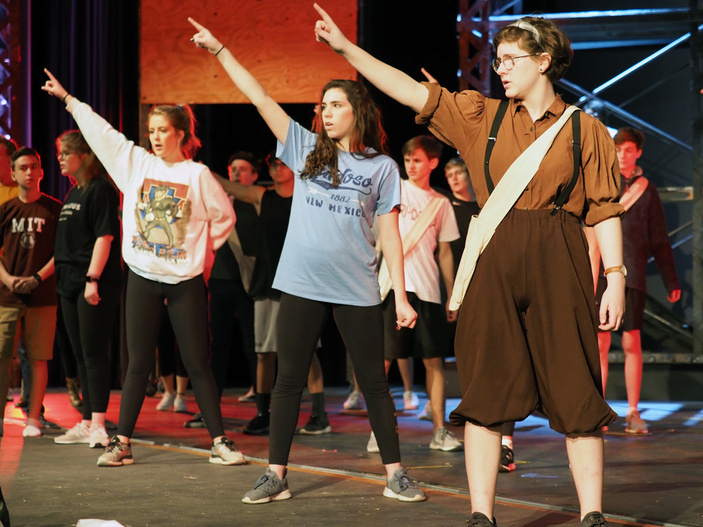 The Marble Falls High School choir and theater programs are producing "Newsies The Musical" on Thursday, Saturday, and Sunday, Jan. 17, 19, and 20. Showtimes are 7 p.m. Thursday, 2 p.m. and 7 p.m. Saturday, and 2 p.m. Sunday. All performances take place in the school auditorium, 2101 Mustang Drive. Tickets are $10 for adults and $5 for students. Reservations may be made by contacting (830) 798-3664 or showtkts@mfisd.txed.net. The musical is based on the 1992 film “Newsies,” but with some changes. The musical has several female roles, which the movie didn’t have. The theater production contains original music from the film as well as a few more songs. At the heart of the musical are the newsies, a group of orphans trying to earn a living on the streets of New York City selling newspapers. When newspaper owners Joseph Pulitzer and William Randolph Hearst conspire to make more money by raising the “taxes” the newsies pay in order to sell their papers, it triggers an upheaval among the young sellers. The musical tells the story of how the newsies organized and stood up to Pulitzer and Hearst, two of the most powerful people in the country at the time. As for this being one of the best, if not the best, musical production the choir has put on while Gage has been director, he pointed to several reasons. First, he and co-choir director Emily Chavez realized they had the right students to pull off "Newsies." Then, they added Tenisha Graham, a dance instructor and Highland Lakes Elementary School staff member, as choreographer. Another reason is the set, which Gage credited to the creative genius of theater arts teacher Jon Clark. “I don’t know if people realize how good he is,” Gage said. Clark came up with a set design that includes three scaffoldings made to look like old New York apartment landings, outside stairs, and fire escapes. The three pieces are set up in front of a projection of New York around the turn of the 19th century. It’s more than just how the pieces look; it's also how they move. Instead of simply moving the sets into place, Clark has basically choreographed their placement so they are moved as part of the show and music. There’s even a chase scene where the characters jump from one scaffolding to the other as students shift the structures. “Jon’s brilliant when it comes to set design,” Gage said. The students bring the story to life through their acting, singing, and dancing. It’s a tough production, one that challenges the students. The show even includes tap dancing, something the choir program hasn’t tackled in previous shows. “But why wouldn’t we want to push the envelope with the kids and see them rise?” Gage added. “That’s our role as teachers: to challenge our kids and let them grow.